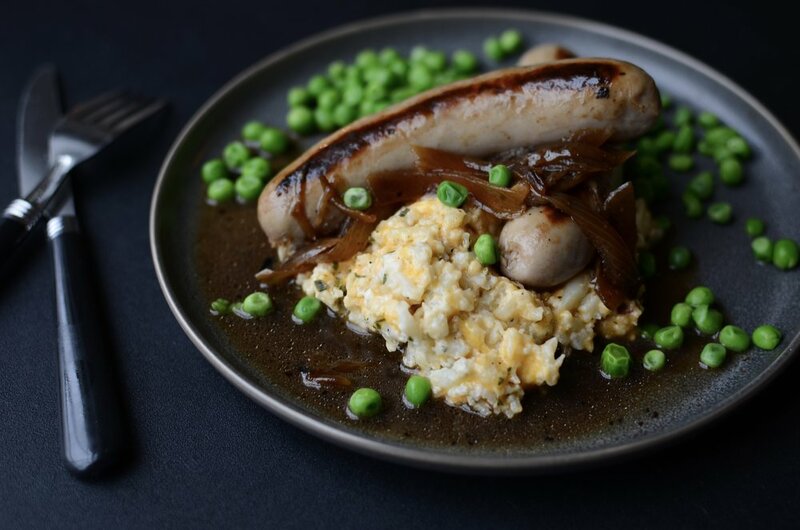 Bangers and Mash is a British meal traditionally made with mashed potatoes, but today I’ve opted to switch out the potatoes for mashed loaded cauliflower in order to make the meal more keto-friendly. Don’t get me wrong, potatoes are my all-time favorite vegetable, but for 1/5 the carb load, I don’t mind subbing cauliflower now and then. With yummy additions like cheese and bacon, I promise you won’t miss the spuds. Drizzle olive oil in a heavy-bottom skillet and brown bangers on each side; remove from pan and make onions in the same skillet, without cleaning the skillet. In the same skillet used to cook bangers, melt the butter and saute the onions until they are caramelized, stirring frequently. Add water to deglaze pan and return bangers; simmer until bangers are heated through. Mash together the hot steamed cauliflower, cheddar cheese, butter, sour cream, and crumbled bacon; taste and add salt and pepper as needed. Garnish with sliced scallions or chopped chives if desired. Tired of the same old boring boiled cabbage on St. Patrick's Day? Try this quick and easy way to braise it in butter! Yes, butter. Hey, St. Patrick's Day only happens once a year - live a little! Start by coring half a head of green cabbage (mine cored half weights about 2 pounds). Slice the half into half again and slice thinly. Be sure to use a good quality sharp knife (this is one of my favorites). Add butter and oil to a large pan over medium heat. Today I'm cooing in this Copper Chef Pan that I received as a gift. So far, so good, and I kinda dig the square shape. And the salt and pepper. Toss well and cover for about 5 minutes to help the cabbage wilt down a bit. Uncover the pan and continue cooking the cabbage, stirring frequently, until the cabbage wilts down and begins to caramelize. Done - that only took about 10 minutes all together. In large skillet, heat butter and oil over medium heat. Add cabbage, salt, and pepper; stir well. Cover pan and cook for 5 minutes, remove cover and stir well. Continue cooking, stirring frequently, until cabbage wilts down and begins to caramelize.